Angstadt Arms has taken the wraps off their SCW-9 Sub Compact Weapon and their new Sub Compact Stock that is short, short, short! Charlotte, NC, (November 14, 2018) Angstadt Arms is proud to introduce the SCW-9 Sub Compact Weapon. The SCW-9 was designed to meet the strict requirements of the U.S. Army Sub Compact Weapon program. At just 14.7” long and 4 lbs., the SCW- 9 provides greater lethality than pistols and much greater concealability over standard rifles. With a rate of fire of 1,110 rounds per minute, the SCW-9 is capable of accurately engaging threats with a high volume of lethal force. In addition to 9mm, the shortened stock system developed for the SCW-9 has been tested in both 5.56 NATO and .300 AAC Blackout calibers. This allows any M4 style rifle to reduce its overall collapsed stock length from 7” to just 2.5”. Making it the shortest telescoping AR-15 stock system available. Angstadt Arms has plans to offer the shortened stock system to other manufacturers who wish to incorporate it into their firearms. 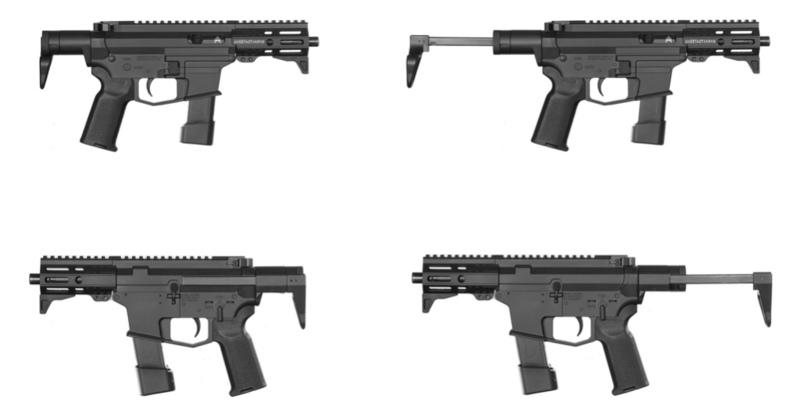 A pistol brace version of the shortened stock system is currently in development for the U.S. commercial market. About Angstadt Arms: Angstadt Arms designs innovative weapon platforms for military, law enforcement and responsible citizens. Their flagship UDP-9 9mm AR and sub-machine guns are currently deployed in over 25 countries worldwide.